Ayurvedic medicine is an ancient Hindu practice spanning over 5,000 years; the practice treats the whole body balancing the physical body, mind, and spirit. The term itself is translated to the “knowledge of life,” so if you’re practicing Ayurveda, you will experience the knowledge of life. The practice is known to treat minor ailments and promote good health of the human being. Harmonizing the five elements, earth, water, fire, air, and ether in the form of doshas within you brings the whole body into balance; leaving you with better health, stamina, and overall spirit. Imagine, to feel balanced and in tune with Mother Earth’s energy. Ayurveda practice examines the universal life force and your reaction to each of the elements. Spring is the time of rebirth and new growth. It is the perfect time to let go, and make space for a renewed Self. You will get back to your natural state of balance, experience better sleep, return to a healthy weight, and get in touch with your inner Self gaining a connection to your natural rhythms. 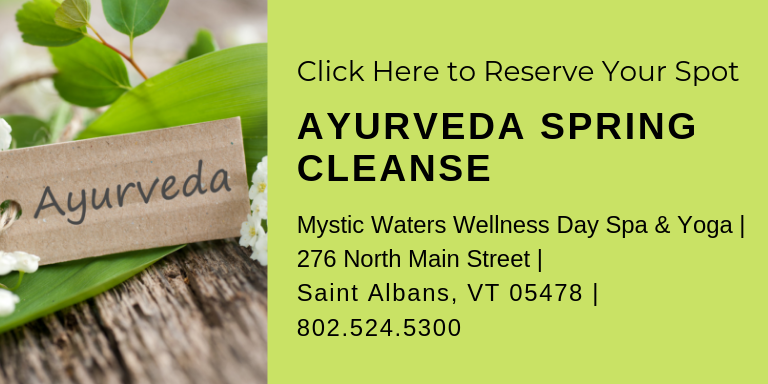 Learn More About Our Ayurveda Spring Cleanse and Reserve Your Spot Call 524-5300. When you think of the effects of food, external stimuli, and environmental factors you realize what might accumulate over time in your body. For healthy living, and according to Ayurvedic practices, you want to cleanse with the cycles of Mother Nature. She balances the Earth, and with Her, you balance your body. The doshas are three primary energies found within each individual and are derived from the five elements. These energies live within the body and the mind, to which each person has a primary force; we call this your constitution. The Vata is made up of the elements of Space and Air. Think of people who might be thin, fast-moving, quick-thinking. If you identify with some of these traits, you could be made up of the Vata qualities. The Pitta primary elements are Fire and Water. You might identify with this constitution if you have a fiery personality, get hangry, or react to stress with angst or a quick temper. The Kapha includes the elements of water and earth. Typically, characteristics a person might have are calm temperament, sturdy build, and extra stamina. Each person is unique, and usually has a dominant constitution, and most have a little bit of each; still, though, some have a more even blend of two. It’s important to know your make-up because it will help you to attune your body with the Earth. An Ayurveda practitioner will help you to identify your constitution and areas of imbalance, and provide you with guidance tailored to your remarkable body, mind, and spiritual needs. In addition to your recommendations of diet, exercise, and practice, you will receive various supplies, which could come at an additional expense: supplies, including supportive herbs, recipes & online resources. Once you’ve established your primary constitution and you’ve received instructions from your practitioner, you will begin clearing the body of Ama. What is Ama exactly? Ama is the toxins that build up in your body. These toxins build up because of stress, diet, lifestyle, and pollution. You’ll hear a lot about this as you learn about Ayurvedic medicine. Consider what might happen to your body if these toxins are building up and never released. They’re slowing you down, causing headaches, poor sleep, lack of stamina, illness – the list goes on. There are multiple ways your practitioner will guide you in removing these toxins. It will be through diet and Self-care, as well as, physical exercise direction, possibly yoga or walking; supplements you receive will also aid in freeing the body of Ama. Clearing your body of Ama, allows you to make space for what you need now. Making room for what you need now encourages your body to come into harmony with the Universe; with Mother Nature. Without toxins, you have more energy, greater strength, and a healthier mind and body. It’s easy to get started, you only have to find a practitioner to assist you in identifying your dosha, Ama, discover blockages and develop the solution for you. 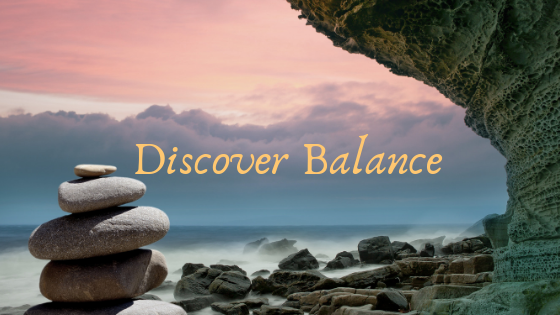 You’ll identify your imbalances internally, and with Mother Nature, and with some effort and dedication, you can come back into alignment restoring your body and mind.